On paper, Bayern München had the most comfortable draw of all the quarterfinal matchups. 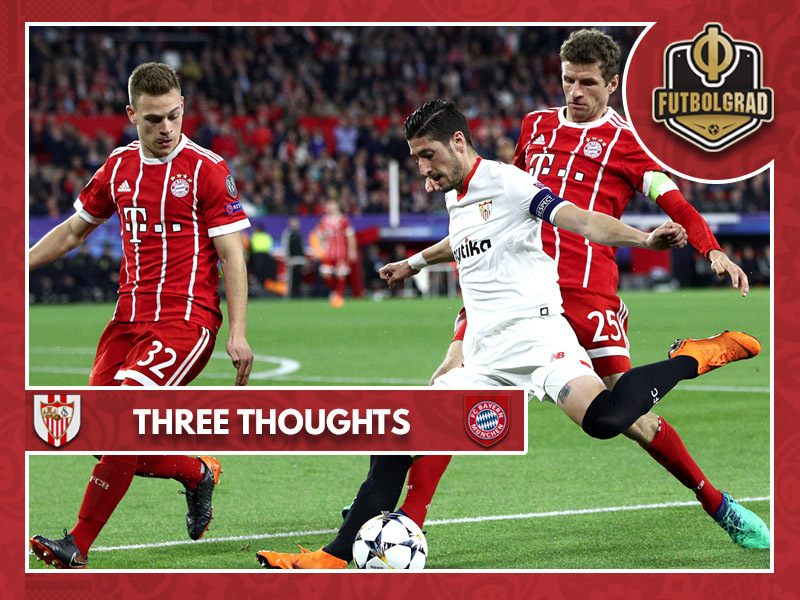 Sevilla took the game to the Bavarians, however, and although the Rekordmeister came out on top in a great comeback victory, the Spaniards showed that they are a capable side. Can Bayern’s comeback victory help to overcome the club’s Spanish trauma? Real Madrid eliminated Bayern in the semifinals of the 2013-14 season, Barcelona were a step too far in the 2014-15 season, Atlético Madrid destroyed their dreams in the semifinals of the 2015-16 season. Finally, last season Bayern were eliminated by Real Madrid in the quarterfinals in what was one of the most controversial Champions League games in recent history. The string of poor results against Spanish sides have caused a bit of trauma among Bayern fans living in the Bavarian capital. The victory might not only put Spanish tapa bars located in Munich at ease but also Bayern supporters as die Roten now have the upper hand when the game returns to Munich. Dispatching Sevilla might help heal some of the wounds, but the real test will likely wait in the next stage of the competition with Real Madrid, in particular, looking strong in their 3-0 road victory against Juventus Turin. Frank Ribéry highlights that he is still valuable to this side. After an excellent performance against Borussia Dortmund, Frank Ribéry was given the start ahead of Dutch winger Arjen Robben by head coach Jupp Heynckes. The decision proved to be crucial. Moments after Sevilla’s goal Frank Ribéry made an excellent forward run that caught much of Sevilla’s backline scrambling and his hard cross was then deflected into the goal by Jesus Navas. “Scoring the equaliser right away was crucial,” Heynckes later told the media. Ribéry, however, was not done there. The French winger also assisted Thiago’s game-winning goal with a fantastic deep cross. The two assists were not quite enough to win him the Futbolgrad Network man of the match award – that title went to Thiago – but Ribéry’s performance was outstanding. Taken off in the 78th minute for Arjen Robben Ribéry has now put in two strong performances in a row in two crucial fixtures. Two good arguments when it comes to the coming contract re-negotiations as Bayern want to approach the 34-year-old French winger in April. Ribéry, however, has two offers from China and Qatar and there is now some suggestions that Ribéry is upset with Bayern holding out on talks. 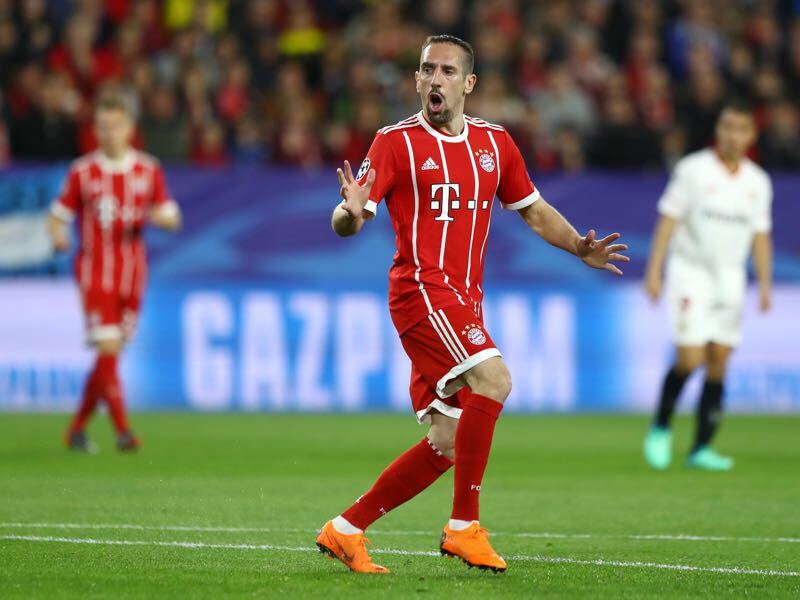 But an upset Ribéry is usually at his best as his performance in Bayern’s comeback victory against Sevilla highlighted. Jupp Heynckes sets a new record. Bayern’s comeback victory also set a new record. Jupp Heynckes has now won 12 games in a row in the Champions League more than any other coach in the history of the competition – he previously shared the record with Louis van Gaal and former Bayern coach Carlo Ancelotti. Heynckes has been heavily courted to continue his work beyond this season. But Heynckes has now been clear that his work is done and that he will beyond doubt retire at the end of the season. The 72-year-old has done a remarkable job resurrecting the Bayern after Carlo Ancelotti got fired and replacing the head coach will be very difficult for Bayern München – primarily as the most obvious candidate, Thomas Tuchel, has since turned down the job. Krasnodar – Can Murad Musaev bring them to the next level?